[Step Six] is A.A.’s way of stating the best possible attitude one can take in order to make a beginning on this lifetime job. This does not mean that we expect all our character defects to be lifted out of us as the drive to drink was. A few of them may be, but with most of them we shall have to be content with patient improvement. The key words “entirely ready” underline the fact that we want to aim at the very best we know or can learn….Only Step One, where we made the 100 percent admission we were powerless over alcohol, can be practiced with absolute perfection. The remaining eleven steps state perfect ideals. They are goals toward which we look, and the measuring sticks by which we estimate our progress. Seen in this light, Step Six is still difficult, but not at all impossible. The only urgent thing is that we make a beginning, and keep trying. When we tried to clean ourselves up with our own power and “discipline” we kept ourselves agitated, confused, in denial, and worn out, and we were in almost constant emotional pain. We were like the man who tore the scab off his arm every morning to see if his wound had healed. But it was in doing the sixth step that I saw why I had become so exhausted. I’d been trying to do God’s part in the spiritual growth and healing process. In the program I was told that my part was “being entirely ready,” being ready to let God be the controller and life-changer of myself and others. When I did that, my sponsor said, I would see how God’s power is released to flow through our lives to clean them only when we quit trying to control the how and when he is to use that power. Change is difficult. Even changes that we want to make are difficult. So we need to prepare ourselves for the change process. In Step Four we identified patterns of behavior that have been hurtful to us and to others. These negative patterns are defects of character that developed in our lives over a long period of time. Some examples of character defects are blaming others, controlling others, isolating ourselves, and numbing our feelings. We may have observed during our inventory that we use blame to protect ourselves from realities that we do not want to face. Or we may have observed that we withdraw from the people closest to us whenever there is a conflict. Or we may have seen how we medicate ourselves with chemicals, food, TV, or work to avoid feeling emotional pain. These and other behaviors are often survival skills that helped us at one time in our lives. But they are no longer helpful to us. They have turned into character defects–patterns of behavior that are hurtful to us and to others. 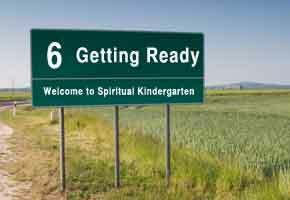 In Step Six we prepare ourselves to let God change these well-established behavior patterns. After all the work we have done on the first five Steps, you might think that we would be ready–if not eager–for God to remove our defects of character. So why is a whole Step reserved for getting ready for this to happen? Unfortunately, the character defects that we identified in our inventory are often behavior patterns that we think are important for our survival. When we were children these behavior patterns may have protected us, given us some sense of control over our lives, or helped us to stay at a distance from intolerable circumstances. For example, silence and isolation may have helped us to feel safer in a frightening home environment. But that same strategy, which once seemed so helpful and necessary, is now part of our problem. Part of becoming “entirely ready” for God to change us is to admit that we have become attached to these behaviors and that letting go of them may not be easy. The process of becoming “entirely ready to have God remove all of our defects of character” is similar to grieving. We are losing something that once seemed valuable to us. Grieving will take time and may involve some sadness. But grieving is a necessary part of letting go. As we go through the grieving process, however, we will find comfort and peace. We will learn healthier, more productive, and more joyful ways to live! Jesus put it this way: “Blessed are those who mourn, for they will be comforted” (Matthew 5:4). Notice that the goal in Step Six is not speed; we do not seek to get ready as fast as possible. The goal is thoroughness; we seek to become entirely ready. Step Six allows us the time necessary to grieve the loss of the defects we must give up. It is a time to prepare for God to do spiritual and psychological surgery on our character. We get ready, but it is God who removes our character defects. We do the asking. God does the work. As we learned in Step One, we do not have the power to do what needs to be done. Our focus needs to be on becoming ready. If we think we can make the changes by ourselves, we will find ourselves trying harder and harder–and getting more and more frustrated by our inability to change. When it comes to change, our task is to “let go and let God,” or as God says through the psalmist “Be still, and know that I am God” (Psalm 46:10). Having God remove all of our defects may sound like a huge task. It is a big task. But God’s plans for us involve more than just a superficial makeover. The changes we are preparing for are fundamental ones. Changes in character go down to the core, to bedrock, to our foundation. God’s intentions are to do a heart transplant: “I will remove from them their heart of stone and give them a heart of flesh” (Ezekiel 11:19). This change process will require patience from us. We cannot expect everything to happen overnight. Deep and lasting changes in patterns established over many years will take time. God understands that we will not be “entirely ready” to have him remove “all” of our defects of character all at once.